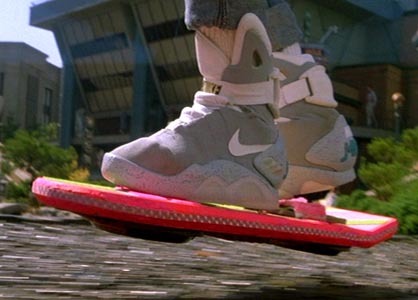 When 'Back to the Future' came out in 1989 I remember looking at the practical velcro on my little sneakers and wishing for self-lacing shoes, just like in the movie. 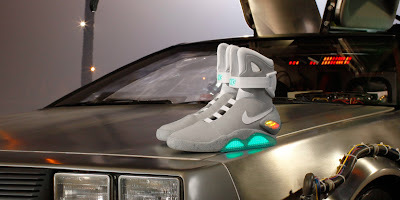 Fast forward to 2011 and Nike is releasing a replica of the then fictional sneaker. 150 pairs are being auctioned on eBay for the next 10 days, with proceeds going to the Michael J. Fox Foundation for Parkinson's Research. The shoe doesn't quite lace itself, but since it doesn't have any laces to begin with, I will forgive them for that. For now at least. I will be checking back with Nike in 2015. I think this is a really awesome thing for Nike to do! Also I love Michael J. Fox.